Just days after announcing its expansion into a fully-fledged two-day festival, ULTRA Taiwan releases its huge Phase One lineup. 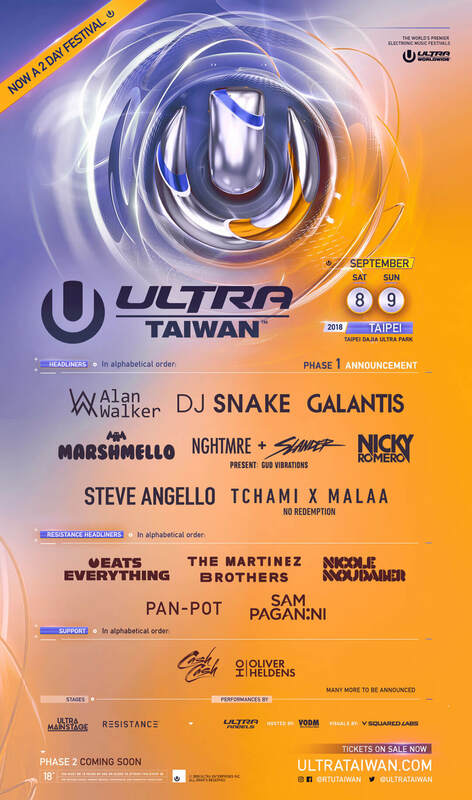 The highly anticipated debut edition of the festival will be held at Taipei Dajia Ultra Park this September 8 & 9, with an expected 50,000 Ultranauts in attendance at the riverside venue. With the addition of multiple stages this year, including a dedicated RESISTANCE stage, a vaster array of world-class talent will be on display at Taipei Dajia Ultra Park than ever before. International superstars Alan Walker, DJ Snake, Galantis, Marshmello, NGHTMRE + Slander present: Gud Vibrations, Nicky Romero, Steve Angello and Tchami x Malaa: No Redemption will all headline the Main Stage throughout the weekend. Cash Cash and Oliver Heldens will provide the support. The brand new RESISTANCE stage will host performances from house and techno luminaries Eats Everything, The Martinez Brothers, Nicole Moudaber, Pan-Pot and Sam Paganini in what is sure to be a momentous occasion for the burgeoning concept. After a highly successful four years of Road To ULTRA, the debut edition of ULTRA Taiwan is set to reach even greater heights than its predecessor. With many more acts yet to be announced, fans can eagerly anticipate what will be the greatest display of electronic music talent in Taiwan this year.